Home SPIRITS & LIQUEURS Beer New Year, New Beer! As I have mentioned before, I’m a beer fan. Annoyingly, we’ve not had many on the website, with our small selection consisting of a pair of great Scottish brewers – Harviestoun and Windswept – and a few beers from Finland’s Teerenpeli. However, we’ve just added a stack of new breweries from closer to our home – we’re now stocking a large range of London beer. London’s seen an explosion in the number of beer makers over the past five years. In 2010, the first London Brewers Alliance festival was held in a smallish room above Brew Wharf near London Bridge, with 18 brewers in attendance. The LBA now have 77 members and in total there are more than 100 breweries in London – pretty good work for five years. We’re not done with new beer yet – keep an eye out for bottles from Brixton Brewery and Weird Beard soon – but with 12 new breweries on our books, we thought we’d better let you know a bit about them. Beavertown: One of the most noticeable brewers at beer festivals, thanks to their colourful and eye-catching can and label designs, which they back up with excellent beer. I discovered them thanks to their 8 Ball Rye IPA, but these days seem to drink a lot more Gamma Ray – their American Pale Ale. Not quite as over the top as some IPAs, it’s a punchy pale with loads of fruity hops. Brew By Numbers: The one brewery on the London Beer Mile (a line of breweries through Bermondsey that make for a nice Saturday afternoon walk) that I haven’t visited, and based on their line-up, I need to. They like numbering their beers, hence the name, with the first number indicating the style and the second the recipe. I’m a fan of their Golden Ale – a bit stronger than some and not entirely sensible for an afternoon beer session, but excellent as an occasional treat. 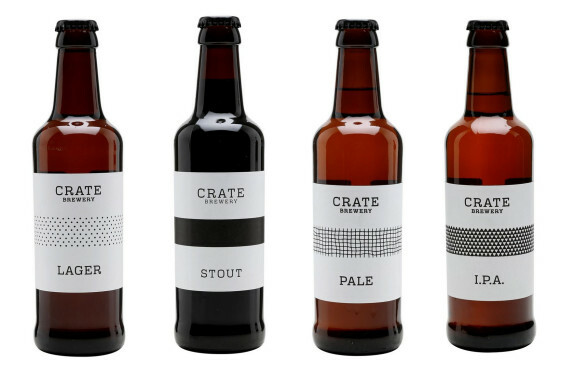 Crate: While many of the London brewers produce large numbers of weird beer styles, Crate just make a few excellent beers. 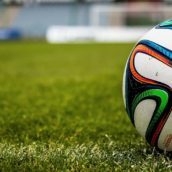 With a core line-up that includes lager, pale ale, IPA and stout, they won’t win awards for craziness, but they have been picking up accolades for great-tasting and easy-drinking beer. I’m a fan of the Crate Pale, which is a great example of a beer that knows how to use hops to add fruitiness and bitterness without going over the top. ELB: In my opinion, East London Brewing is consistently one of the best London brewers. Their range is more focused towards traditional British beer-making, but they’re not afraid to take inspiration from elsewhere. My current favourite is Quadrant Oatmeal Stout, a properly rich and roasty beer, with well-balanced fruit and bitter malt. Five Points: Based in Hackney, Five Points are my go-to brewery when I can’t make up my mind what to drink. Since I first tried the Five Points Pale at a gig at Alexandra Palace – who knew that you could get good beer at a gig? – it’s been a standard choice for me whenever I see it: nice and hoppy with enough character that you can drink it all night without getting bored. Gipsy Hill: A brewery that I’m still investigating, Gipsy Hill have an ethos that I can firmly get behind – producing great-tasting beers that aren’t too strong. While many new breweries go for strong beers with jacked-up flavour, Gipsy Hill make a range of easy-drinking beers that aren’t silly. My choice is the Southpaw Amber, which balances bitter and fruity hops with a great toffee and malt backbone, and at 4.2% ABV you can treat yourself to a couple. Howling Hops: In contrast to the last few breweries, Howling Hops are all about being a bit silly. As you can tell from the name, they like hops, and they make intensely flavoured beers that can be over the top. That’s no bad thing, and their Rye Wit is my choice – a mash-up of rye pale ale and wheat beer, with stacks of hops. The result is a heavier than expected pale ale, with loads of rye spice and fruit – bananas anyone? – and a soft wheat-beer body. The Kernel: The granddaddy of the new crop of London brewers. 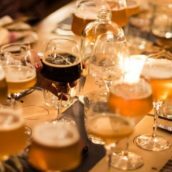 They started in 2010 and not only has brewer Evin O’Riordain helped other breweries get started (including nearby Brew by Numbers and Partizan), but his brewery’s growth from a room under a railway arch and choice of beer styles have been the model that most other brewers have followed since. 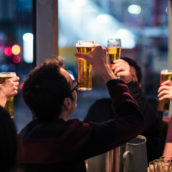 My current favourite of the ever-changing range is Table Beer, because it bucks the trend of most of their releases – it’s a low-alcohol beer, clocking in at 3%. Getting the amount of flavour that The Kernel do into a low-strength beer is very hard and a testament to their brewing skills. Mondo Brewing: Another brewery that I don’t know as well as I’d like. Based in Battersea, they produce a few core beers and an ever-changing line-up of seasonal specials. I’ve not had a chance to try the seasonals yet, but if they live up to the promise of their London Alt, I’ll be happy. Altbier is a style of German ale I normally find quite boring, however Mondo’s take has a great mix of sweet malt and soft hop bitterness that has made me want to investigate further. Partizan: Another stop on the Beer Mile, Partizan is another brewer whose attention to design is matched by the quality of their beers. Their ever-changing labels are beautiful and match the beers, which vary from heavy IPAs to light and fruity saisons and grisettes. While many people jump on the latter styles, which are very much in fashion, it’s the Partizan IPA that I keep returning to – really hoppy and strong at 7%, but still very drinkable. 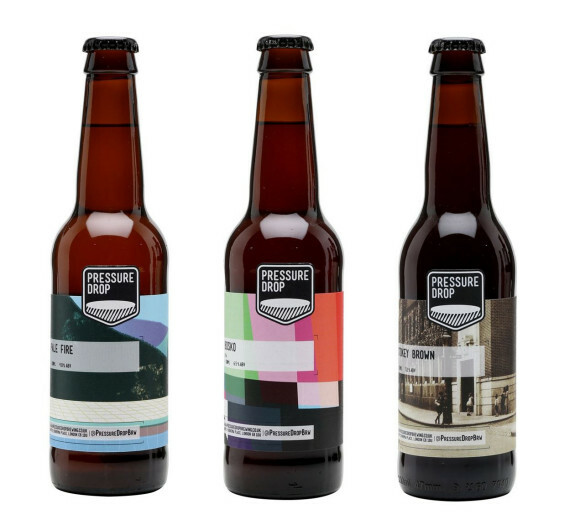 Pressure Drop: Our final new brewery and one that produces probably my favourite London beer. Their Stokey Brown is a great ale – adding some New World hoppiness to a classic brown ale – but for me it’s Pressure Drop Pale Fire. Packed with fruity hops, it’s got lots of tropical-fruit character and is a beer that I keep coming back to. We’ve got lots of new beers, but there’s still more to go – we’re speaking to suppliers and brewers around the UK and will continue to grow the range. Let us know if there are any breweries you think we should check out. All suggestions welcome.